If you are managing Facebook Page then you know how hard is to gain every single Like and following for the page. Although Facebook is having an option which let us invite our friends to like our page. When you invite them, a notification will be sent to them to get notified and if they are interested they can easily like your page. Now, you may be a person who is having about 5000 friends on Facebook. How are you gonna invite all these friends to like the page in a single go? Well, that is what you will find in this article. In this article, you will be working methods to Invite All friends to like a particular page that you manage. It’s nearly too hard for us to manually invite all 5000 people. You will have to check all the boxes against their name and after that sent invitation. That’s too hard. That’s where some Chrome Extensions comes in handy. The extension that we are talking about will automatically invite all your friends to like your Facebook fan page. There are two methods for this. First is by using a Chrome Extension and the other one is by using some Script. Whatever be the method you go with, the result is gonna be the same. In a recent update, Facebook has limited that only 500 people can be invited to like a page a day. Facebook is the largest social networking site in the world and it is necessary to create a Fan page for your blog/Website or any other service you run. 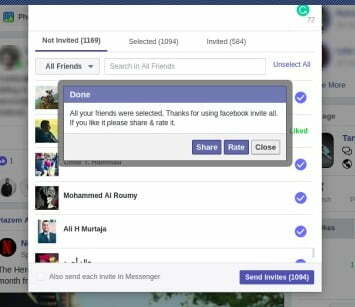 Think that, Suppose you have 5000 friends on your Facebook account and how difficult it would be to invite all by clicking invite button for each and every friend, By using this traditional method it will take about 2-3 hours to complete inviting all your friends. Today, By using the methods listed below you can invite all your friends up to 5000 in a single mouse click, Interesting Huh! I will be sharing two unique methods below. I personally felt the first method is much more easy and simple. Follow the step by step guide to quickly invite every people to like Facebook Page. Once you are done installing and activating the extension, follow the below given steps. 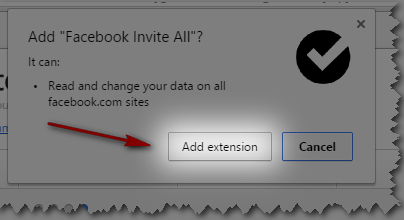 Step 8: Now click on the Facebook Invite All extension icon next to the address bar. In this method, we will be using a script to get the job done. This script should be injected to the Facebook site via Developer options of your Web Browser. It doesn’t matter which browser you are using, you can use any including Google Chrome, Mozilla Firefox, etc. All we want is access to Developer options and the Console tab. We will be adding a little code into the console tab to invite all friends to like our Facebook page instantly. Step 5: After pasting it in Console tab press invite button. See how simple it was to Invite all your friends to like your Facebook Page or invite them for an event. This method will definitely help you if you have more than 50 friends. This awesome chrome Extension can invite up to 5000 Friends in a go with a single click. 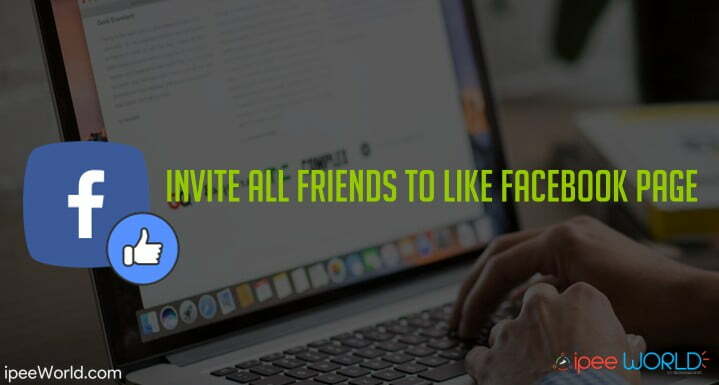 Finally, hope you invited every one of your friends to like your Facebook page using the Chrome extension or using the script mentioned in the second method. Before the recent FB Update was rolled out, people were able to invite as many as 5000 people in a single go. But with the new Facebook Update, then the amount of people that you could invite at once is 500 a day. You can continue inviting other peoples the next day. Whatever it be, this will help you to save a lot of your precious time in inviting everyone. nice article ! keep going .